The Chichester Art Trail happens every May and generally includes Bank holiday Monday in the first weekend. That is what has happened this year too and we are again open to the public. Essentially the criteria for this art trail is that you open your studio to the public so that everyone can see you at work. Unfortunately this doesn’t always happen. And, in fact I am told that very few people are actually working at their art. Therefore , it seems that people are very pleased when they arrive at our ‘venue’ (sounds a pretentious word doesn’t it?). That’s why I call the shed the shed – because it is and was a shed. Actually, it was a loose box, so a shed is an upgrade. But as ever I am off on a tangent. We have had a steady trickle of people since Friday evening. We, and the other artists in Bosham, had a Pimms preview evening for people who live in Bosham. It was quite tough getting everything ready in time, but it was fun once we got there. The people of Bosham did as requested and either turned up on their bikes or ‘Shank’s pony’. For those who are not English, this means ones own two legs. The first day – Saturday- went well enough once everyone had got their weekend shopping out of the way. The weather has been absolutely supper. The sun has been shining and it is very pleasant. 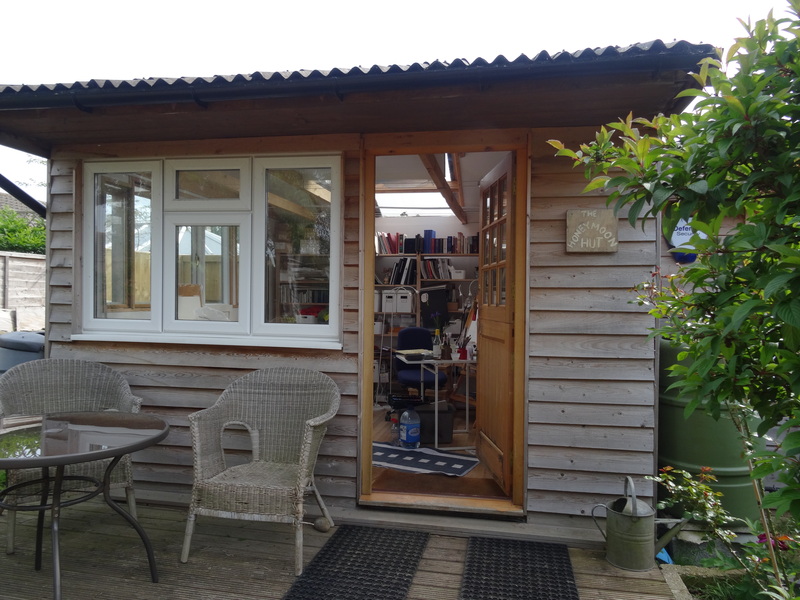 This means I have been able to sit working in the shed with the door open ready for visitors. Yesterday went very well. In fact the first Sunday is usually the best day of the two weekends. With any luck, in writing this the statement will prove me wrong. 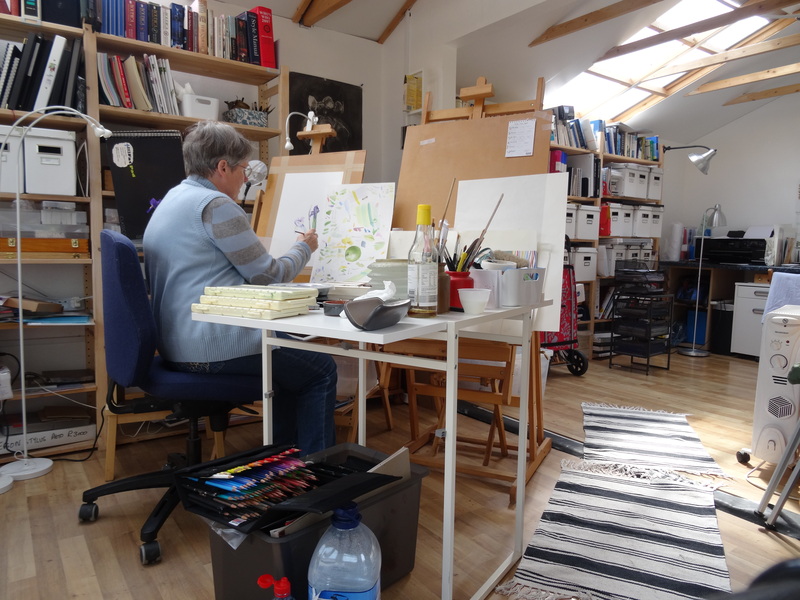 In Bosham there are 15 artists in 11 locations – which tells you that those who share are not able to show their own working environment. As one can’t go any further than the sea when getting to see us (we are about 200 metres from the inlet), we are the last one on the Bosham part of the trail. This means that many drop off the trail before getting to us as there is so much of interest on the way – that is unless they have specifically chosen our place. However, we still get a few who want to see as many artists as they can and that gives me a real opportunity to get people interested in botanical art. Our set-up is that we have a gallery of my pictures in the conservatory (where I normally have workshops). My husband mans this area as he loves talking to the people that come. I am working in the shed so that people can see what I do and ask as many questions as they want to. Mulling over the questions I have had, perhaps I have chosen the wrong medium that I am using in the shed. I chose to do some purple irises in watercolour as I haven’t used that medium in a whole painting for some time. The conservatory (Gallery for the day)contains the RHS Silver Gilt medal Crab apple series, which is in coloured pencil and attracts a lot of attention, but also some of the Magnolia x soulangeana series in watercolour that I did as an RHS exhibit in 2011. Visitors are astounded when my husband tells them that the crab apple series is in coloured pencil and therefore they are asking about the coloured pencils all the time. There seems to be less of a thrill about watercolour, although a fair amount of interest as to how I achieved the iridescent purple of the Irises. Visitors do love to see the artists working environment and ask questions about how they do things. That is why it is a shame to hear that very few make themselves available to do this. Glad you like the shed Jane. Regarding the face, I’m still not completely healed. Still a high cheekbone which I’m told is likely to be permanent, still a concentrated blue/ grey area where a dent is occurring. Apparently with impacts like this, the underlying fat disappears leaving a dent – also permanent. But time will tell. No pain anymore though. Anyway that’s my news. The moral of the story, don’t fall downstairs! I have a dent on my cheek where I was hit by a toy golf club when I was little. It now appears as a dimple when I smile. Hope yours does the same, then it won’t be so bad! Your shed looks lovely by the way. Thank you for the positive thinking Chris. I hope too that the final result will be nothing worse. I’m glad you like my shed.